MARINA GOLF PIC - Superb 3 bedroom apartment in sea frontline position with lovely sea views and communal swimming pool. LOCATION This apartment is in a residential complex with covered private parking and swimming pool located in Marina de la Torre Golf Resort, opposite the beach. 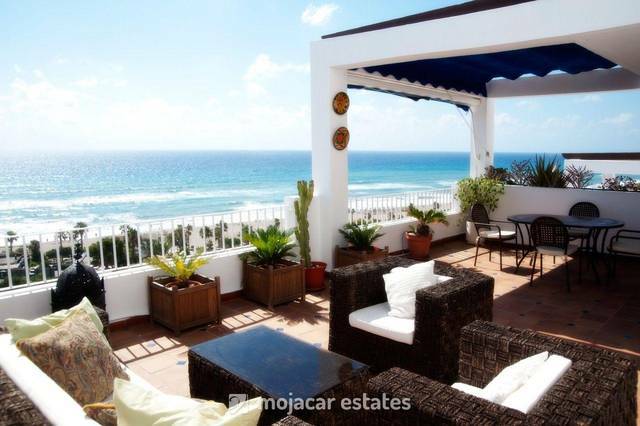 it is in the northernmost end of Mojacar Playa about 1 km away ffrom the village of Garrucha. Golf course and & small commercial centre. Sandy beach with beach bars and sunbed & sunshade hire. ACCOMODATION This apartment is in the ground floor with a front terrace equipped with table chairs and awning overlooking the swimming pool. Entrance hall, separare fully equipped kitchen with arch window on to dining area, separate laundry area outside with washing machine and drier, lounge-diner with patio doors leading out to seafront terrace equipped with dining table and chairs and air conditioning. There are 3 bedrooms, the master bedroom with en suite showerroom, double bed and patio doors opening out to main terrace with sea views, air conditioning. The other 2 bedrooms open up to terrace opposite pool and have twin beds. Both bedrooms have ceiling fans. There is a 2nd full family showerroom. Excellent accommodation. Sleeps max 6. Ceiling fans in all rooms. Very nicely presented.